This species is accepted, and its native range is Mexico. Perennial; caespitose. Rhizomes elongated. Culms geniculately ascending; 50-100 cm long. Culm-internodes elliptical in section. Culm-nodes glabrous. Leaf-sheaths mostly shorter than adjacent culm internode; keeled; glabrous on surface, or pubescent. Ligule a ciliolate membrane; 0.5-2 mm long. Leaf-blades 20-35 cm long; 2-17 mm wide. Leaf-blade surface glabrous, or pilose; sparsely hairy; hairy adaxially. Inflorescence a panicle. Panicle open; ovate; 12-50 cm long. Primary panicle branches spreading; not whorled, or whorled at lower nodes. Spikelets solitary. Fertile spikelets pedicelled. Pedicels 0.2-4 mm long; scabrous. Spikelets comprising 1 basal sterile florets; 1 fertile florets; without rhachilla extension. Spikelets elliptic; dorsally compressed; 2.5-3.5 mm long; 1.2 mm wide; falling entire. Glumes reaching apex of florets; thinner than fertile lemma. Lower glume ovate; 0.33-0.5 length of spikelet; membranous; without keels; 3 -veined. Lower glume apex acute. Upper glume elliptic; 1 length of spikelet; membranous; without keels; 5 -veined. Upper glume apex acute. Basal sterile florets male, or barren; with palea. Lemma of lower sterile floret similar to upper glume; elliptic; 1 length of spikelet; membranous; 5 -veined; acute. Fertile lemma elliptic; dorsally compressed; 2.9-3 mm long; indurate; pallid; without keel. Lemma surface rugulose. Lemma margins involute. Lemma apex acute; pubescent. Palea involute; indurate. North America: southwest USA, south-central USA, and Mexico. Paniceae. Fl N Amer 2007. 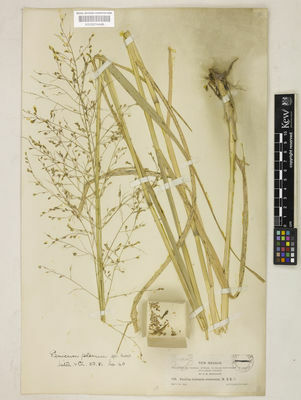 Panicum garadei Sundararagh. & Karthik. Clayton, W.D., Harman, K.T. & Williamson, H. (2006). World Grass Species - Synonymy database The Board of Trustees of the Royal Botanic Gardens, Kew. Dávila, P., Mejia-Saulés, M.T., Gómez-Sánchez, N., Valdés-Reyna, J., Ortíz, J.J., Morín, C., Castrejón, J. & Ocampo, A. (2006). Catálogo de las Gramíneas de México: 1-671. CONABIO, México city. Cope, T.A. (1982). Flora of Pakistan 143: 1-678. Department of Botany, University of Karachi, Karachi. Bor, N.L. (1970). Flora Iranica 70: 1-573. Naturhistorisches Museums Wien. Karthikeyan, S., Jain, S.K., Nayar, M.P. & Sanjappa, M. (1989). Florae Indicae Enumeratio: Monocotyledonae: 1-435. Botanical Survey of India, Calcutta.